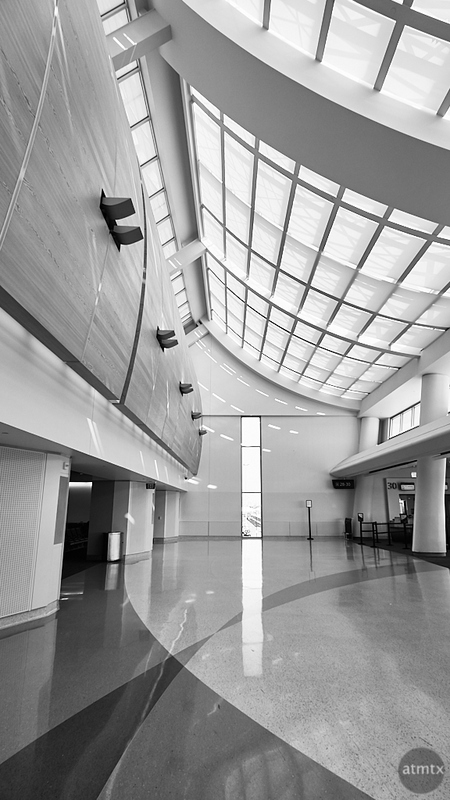 Terminal B at the Mineta San Jose Airport is modern, bright and full of curves — what you would expect of a facility serving Silicon Valley. However, I was never a fan of Terminal A. Its angular design with dark marble walls seems awkward and lacks the uplifting drama of Terminal B.
I’ve showcased what I call Cinematics, wide-angle photos cropped in a 16×9 format that mimic the sweep of movies. Today, a slightly different take — a vertical one. And though it doesn’t make sense to call them Cinematics, per say, because of its vertical orientation, it does still give a sweep missing in less wider (or taller) formats. It is easy to notice the curving walls and skylight, but I didn’t realize the reoccurring theme in the flooring until I made this photo. It does nicely balance the photo, top to bottom, and it’s a thoughtful interior design touch. Really a beautiful design and picture. I love the new Haneda Airport also. If I have a choice I always try to fly into and out of there instead of Narita. Detroit believe it or not also has an amazingly beautiful airport. Thank you, Jerry. I love Haneda too. I’ve only been to the Detroit airport once, some 27 years ago. I just looked at pictures of it. I like how that red tram goes through the terminal.